All transactions are safe and secure with a reliable history in online purchasing behind each of our associates. Buy the Dark Knight Rises Bane t-shirt to own Batman clothing and merchandise. In the spring of 1940, the Joker appeared in the very first Batman comic book. Fifty-three years later, the Dark Knight was introduced to an equally ruthless rival, Bane. 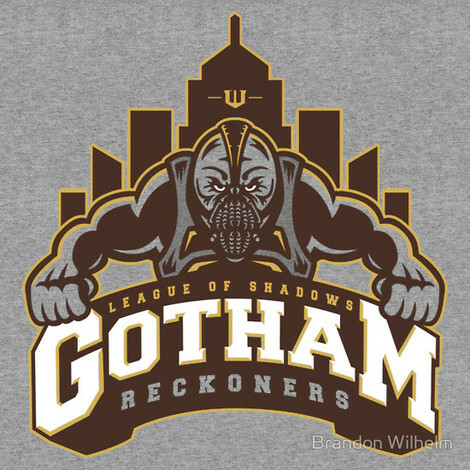 This unique design displays an image of the DC Comics villain looking down on Batman. Bane is a genetically altered criminal and has superhuman strength, as the Dark Knight discovers the hard way. The fronts of these Bane Batman t-shirts display the tough character with his breathing mask covering his face. Pair this with a Joker design or a Junk Food vintage Batman clothing item. In addition to the Dark Knight Rises Bane tee above, browse the Batman Clothing Gallery for more apparel like men's and women's clothes, kids shirts or hoodies.